All across the nation, summer ushers in a season of outdoor grilling and al fresco dining as families host backyard barbecue gatherings. Traditional barbecue fare that was once laden with heavy mayonnaise dressings, sugary barbecue sauces and rich desserts has seen a makeover in response to today’s quest to consume healthier culinary choices. Consider these ideas to lighten your barbecue meals without sacrificing flavor. Hot dogs and hamburgers have always reigned as an American barbecue staple. For smaller doses of cheeseburger goodness, offer sliders on the menu instead of full-sized burgers. These miniature variations on the burger theme will result in eating less. Most people consume more than one cheeseburger over the course of a barbecue. The presentation of three sliders on a plate tricks the mind into feeling satiated, even though the total amount of meat, cheese and bun consumed is still less than that of a traditional burger. Choose lean ground beef and whole wheat rolls. Swap out traditional hot dogs for chicken sausages. Today’s chicken sausages are bursting with the flavors of added chopped peppers, apples, herbs or chilies. Other lean meat choices for grilling include pork tenderloin, chicken, pork chops and steaks. Season the meats with a dry spice rub or a flavorful homemade marinade. Alternately, fish steaks such as tuna, salmon and swordfish offer a healthy serving of omega 3 fats. Instead of serving chips and salads that are clumped with heavy mayonnaise, try grilling some side dishes by throwing vegetables on the grill. Grill friendly vegetables include eggplant, zucchini, summer squash, bell peppers, mushrooms, onions, fennel and tomatoes. Starchy sides that can also be prepared on the grill include potatoes, corn on the cob and sweet potatoes. The only seasoning these delectable treats require is a seasoned olive oil to brush on during the cooking process. Skewers of cherry tomatoes add a pop of bright color and fresh summer flavor to any dinner plate. Choose vegetables that are at their current peak. When preparing a potato salad, consider tossing it with olive oil vinaigrette, a little Dijon mustard and some chopped fresh herbs for a lighter alternative that can also withstand sitting out on the deck for a few hours. Pasta salads, while containing some mayonnaise in the dressing, can be made healthier by opting for whole wheat pasta, using less mayonnaise and more olive oil in the dressing and loading the salad with a variety of colorful chopped vegetables such as red onions, scallions, bell peppers, halved grape tomatoes, peas, etc. Whole grains such as wheat berries, quinoa and Israeli couscous provide the palette for healthy salads when tossed with creative combinations of chopped roasted vegetables, chopped onions, fresh cucumbers, tomatoes, healthy fats such as nuts, cubed avocados or olives and fiber rich carbohydrates such as chick peas, corn or black beans. Homemade iced teas prepared with flavored herbal tea and sweetened with a fruit juice that does not contain added sugars are a healthier option than sodas and store-bought iced tea mixes. Homemade lemonade prepared with freshly squeezed lemons and just enough sugar to take away the tartness contains less sugar than corporate mixes and will not include artificial flavors or colors. In lieu of salty and greasy potato chips with creamy dips, offer tortilla chips with salsa, pita chips with hummus and bowls of nuts, wasabi peas and olives. At long last, fruit is being embraced and appreciated for its natural sweetness when it comes to healthier dessert alternatives. Try grilling slices of pineapple until the natural sugars caramelize the surface and serve with a scoop of frozen yogurt. Other fruits that hold up well on the grill include stone fruits such as peaches, plums and nectarines. Thread alternating halves of plums and nectarines on skewers before grilling and then serve the dessert kebabs with a yogurt dipping sauce. For extra sweetness, fruits may be lightly sprinkled with brown sugar while grilling or drizzled with honey before serving. Celebrate the colorful bounty of summer fruits by creating a fruits salad with different colored berries, green honeydew melon, sliced stone fruits, grapes and other delicacies. Toss in a few nuts for crunch, if desired, drizzle with honey and serve over whole grain waffles. Summer grilling has never been so healthy and simultaneously satisfying and flavorful. Encourage healthy choices, better eating and better living by serving some of these lighter alternatives at your next summer barbecue event. GasGrillsNow.com is one of nation’s largest suppliers of gas grill products. 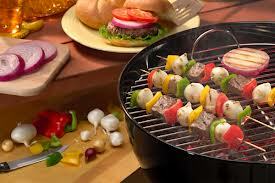 We are your source for gas grills, electric grills, outdoor kitchens, and grilling accessories.